Celebrating the life of Oscar Combs Jr.
Be the first to share your favorite memory, photo or story of Oscar. This memorial page is dedicated for family, friends and future generations to celebrate the life of their loved one. 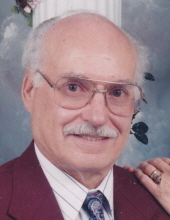 Obituary for Oscar Combs Jr.
Oscar Combs Jr., 90, Copeland passed away Wednesday, November 28, at the Kentucky River Medical Center in Jackson. He was a member of the First Church of God at Beattyville and a veteran of the US Army serving in WWII. He was also a Kentucky Colonel. He was the widower of the late Omeda Strong Combs and the son of the late Oscar and Bertha Combs. He was also preceded in death by one daughter, Ceilia Joette Ward and one brother, Mitchell Combs. He is survived by one son, Marvin K. Combs; three brothers, Charles Combs, Raymond Combs, Ted Combs; three sisters, Myrtle Bellamy, Dorothy Cornett, Gracie Owens; five grandsons, Michael K Combs, Marvin K.(Krystal) Combs, Jason(Stephanie) Ward, Jeremy Dwayne(Joanna) Vaughn, Brian Nathaniel(Casey) Vaughn; four great grandsons, Scotty, Skylar, Jonathan, Levi; three great granddaughters, Kayla Lynn, Kerstie, Carlie. Visitation Thursday, November 29, 6PM. Funeral Friday, November 30, 1PM with Rev. Brack Strong and Rev. Tom Crawford officiating. Burial in the Jackson Cemetery. To send flowers or a remembrance gift to the family of Oscar Combs Jr., please visit our Tribute Store. "Email Address" would like to share the life celebration of Oscar Combs Jr.. Click on the "link" to go to share a favorite memory or leave a condolence message for the family.